Looking for cycling trousers? Check out our Buyers Guide! What is the most important cycling equipment? A helmet, protectors, and comfortable cycling trousers of course! Good cycling trousers are robust, comfortable, flexible, and they come with a great deal of features. No matter if you're into action packed road bike tours, fast downhill rides with your mountain bike, or relaxed family trips. High-quality cycling pants make any tour a success. So jump right on that saddle and kick those pedals! What do cycling trousers have to offer? Comfort is an important factor that should be considered when it comes to long-distance tours in particular. Good cycling trousers fit your body firmly and comfortably. Even after a long day's ride, these trousers shouldn't start itching or pinching. As you have to concentrate on the track that lies ahead of you, there is no use for uncomfortable or distracting trousers. Flat seams make sure that the pants' inner surface doesn't rub against your skin, and soft fabrics feel great on your legs. The chamois is another important factor that makes high-quality cycling pants. During long tours, you spend a considerable amount of time sitting on your saddle. And this is where the entire weight of your body is centered. Sufficiently padded bike shorts or long cycling trousers protect you from unpleasant pressure marks on your buttocks. Good cycling clothing must be functional as well. When you ride your bike without holding back, you will certainly start to sweat at some point. One of the most outstanding characteristics of high-quality cycling pants is their functional fabrics. They are highly breathable and also let humidity escape effectively. The sweat is transported directly through the fabric of the cycling pants to the outside, where it evaporates. This doesn't only keep your skin comfortably dry but also protects your body from overheating. But that's not all! Depending on their individual design, cycling pants come with even more useful features. As an example, antibacterial inserts prevent the seat area from taking on unpleasant odours. If you are aware of all the necessary features cycling pants must have, you only have to choose a suitable model. Which cycling pants would you like? There are many great cycling trousers but depending on the intended purpose, there are designs less suitable than others. If the weather doesn't play according to your rules, you should consider long cycling trousers made of weatherproof materials. 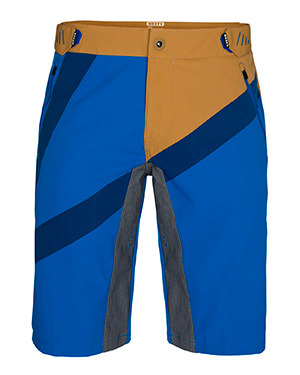 If wind and weather can't keep you from jumping on your bike and racing through the wilderness, these trousers will provide you with the necessary protection. When the situation requires firm fit and maximum grip, try cycling bib shorts. This type of cycling trousers comes with straps and a tight-fit cut, and won't slip even on the roughest of cycling tours. If you prefer somewhat more casual trousers without straps, you should check out our baggy pants. These stylish cycling trousers are comfortable and provide you with complete freedom of movement. No matter if you choose short or long trousers from Löffler, Endura, Mavic, Scott, or Pearl Izumi, the most important thing to consider is that they suit you well. High-quality cycling pants are an essential part of your cycling equipment. So jump into your cycling jersey and pants and off you go!